As I've mentioned before, one of my college roommates got engaged back before Christmas. Of course, with this comes dress shopping. 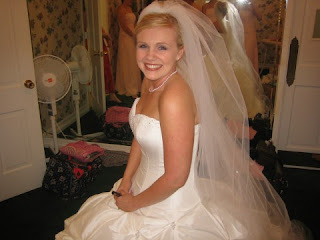 When I got ready to shop for wedding dresses, I thought I would have to try on a million before I found The One, so I was kinda shocked when I fell in love with the first one I tried on and actually had to be talked into trying on subsequent gowns. For me, it was game over within 20 minutes of walking in the store. That being said, Roommate also mentioned to me that she bought the second one she tried on, and it was only number 2 because she tried another one on while waiting for the saleswoman to take it off of a mannequin. So, we are both rather surprised that it was so easy. Is that normal? Did anyone else have that experience, or did you try on dress after dress to find The One? Yeah, this post has nothing to do with anything. I bought the first one I tried on, but still tried on others just to make sure, if I remember correctly. maybe there's something to that... of course, in general you try on what you think will look best first anyways. I definitely agree that you try on what you think will look best, however in my case, the neckline of the dress I picked was a style I had previously said I would "never" wear. Then I tried it and loved it. That was really a fun day for me. I couldn't believe it was so easy. That dress just screamed "Emily". It was almost like it was made with you in mind. Aww, thanks Mom. That was a fun day! And, welcome to my blog. Hey! I did not buy the first one. I tried on a lot. Then I switched over to ivory colored dresses and I think the one I bought was the 2nd or 3rd ivory dress taht I tried on. It was fun. Sometimes I wish I was a bride again! Am I totally crazy? !I just had a great time at the wedding/reception and wished it lasted longer. We're off to SA tomorrow! I'm really excited. We'll try to go to your fav. restaurant. And then we need to head to Joe T's once we get back!! I saw one that I fell in love with as soon as I walked in the store, but thought it was too expensive. I tried on 5 others, but didn't love them. My mom talked me into trying the one I really liked and as soon as I put it on, I knew it was worth the money! I bought the first one I tried on, too! It is still in the closet upstairs, never worn...but yeah, when you know you know! I didn't buy the first one I tried on... but I did find my dress in the bario in Abilene, TX! It was a horribly ugly, brown, run-down dress shop called Rios Bridal (not your typical Dallas bridal botique, for sure!) It had been recommended to us by a friend (we were just stopping through Abilene on our way to Dallas to do real dress shopping). Anyway, after being convinced by mom to "give it a shot" I ended up getting the first one I tried on there! It was perfect! Hey Emily, I came across your blog from other people's blogs! So fun I can see what all you've been up to. I love your wedding dress post, I bought the first one I tried on too! Although I tried on tons after it I always went back to the first one even months later! That's exciting Amanda is engaged! We should catch up sometime!